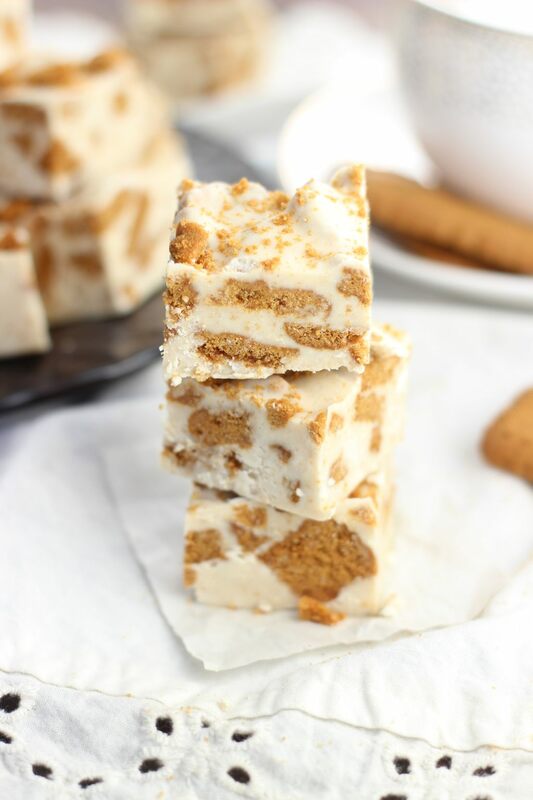 Sweet and crunchy Biscoff cookies, cinnamon bun frosting, and white chocolate chips come together in this super simple and fast fudge! 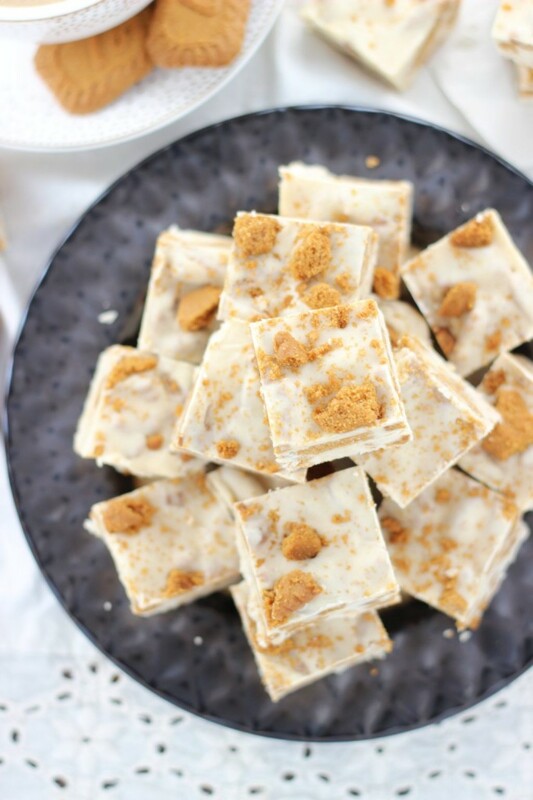 Ready in minutes, this decadent candy will satisfy your sweet tooth! This was fudge was totally unplanned and turned into an unexpectedly awesome recipe. The recipes I share are typically thought out and pretty well-planned. I sit down for brainstorming sessions where I put together long lists of ideas (loooooong), and I spend some time thumbing through cookbooks and magazines for inspiration too. For a few weeks, I plan and debate what I want to bake, then I spend the bulk of my Sundays baking up a storm. Some things work, some definitely don’t. Either way, it’s pretty planned out, and there’s a lot of list-making for groceries, etc. This fudge was 100% spur of the moment though, and what was cool about this spontaneous fudge-making moment, was that it only lasted about 5 minutes. Then it was over, and just like that, we were eating amazing fudge. Really, we were eating this delightful fudge in minutes. I bought a can of prepared frosting – which I never do – but it was Cinnamon Bun flavored, and I was very intrigued. I was tearing the label off the can (no clue why, never do that either), and I spotted a recipe on the inside of the label. It was for fudge. I thought, hey, you can make fudge from frosting? Now that’s just awesome. Better still, I’m thinking that you could probably use ANY flavor of frosting that you want to – and there’s a LOT of flavors. Endless possibilities. Once I decided that Cinnamon Bun fudge can and should be a thing, the wheels started turning as to how I could make it even more cinnamony and wonderful. 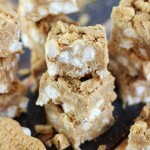 And how I could make it kinda crunchy, because in my world, fudge is better when it has a little texture. 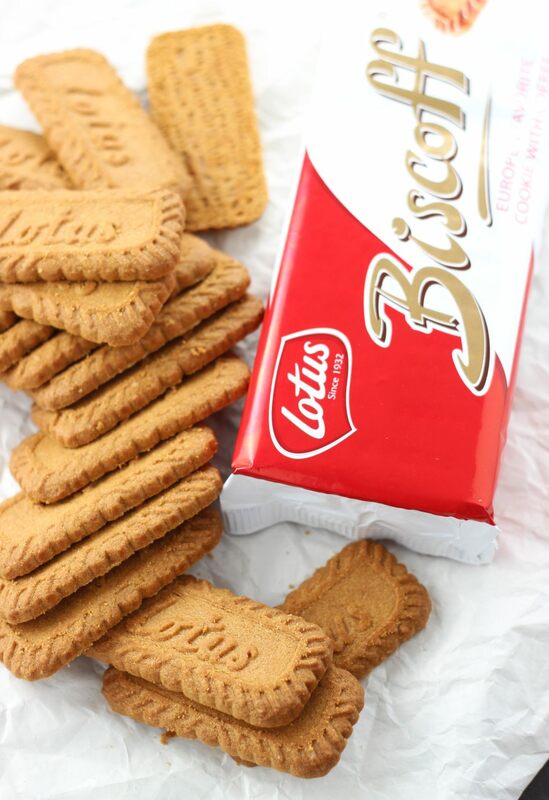 Biscoff cookies are the way to go here. They’re a cinnamon cookie, so it’s a perfect match. A crunchy, sweet, cinnamon cookie. 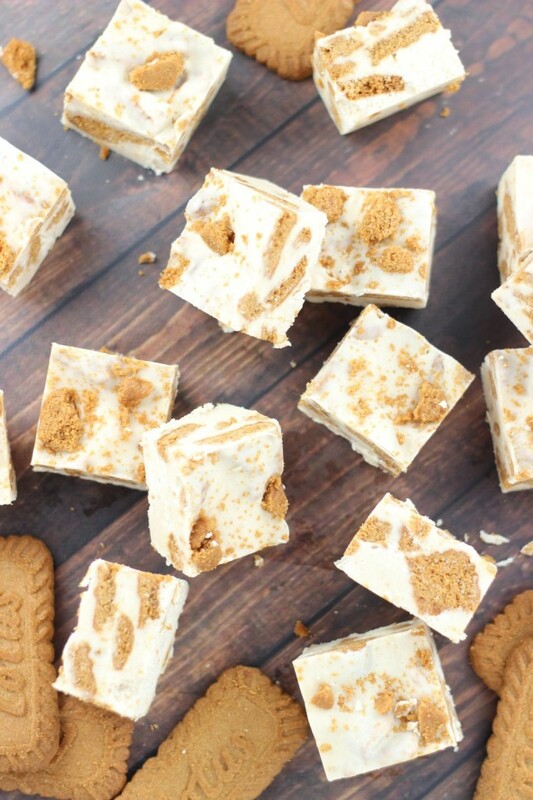 Big pieces of Biscoff cookies, swirled together with Cinnamon Bun frosting and melted white chocolate, that sets into a decadent fudge. You can make it in the microwave within minutes. Easiest candy ever. 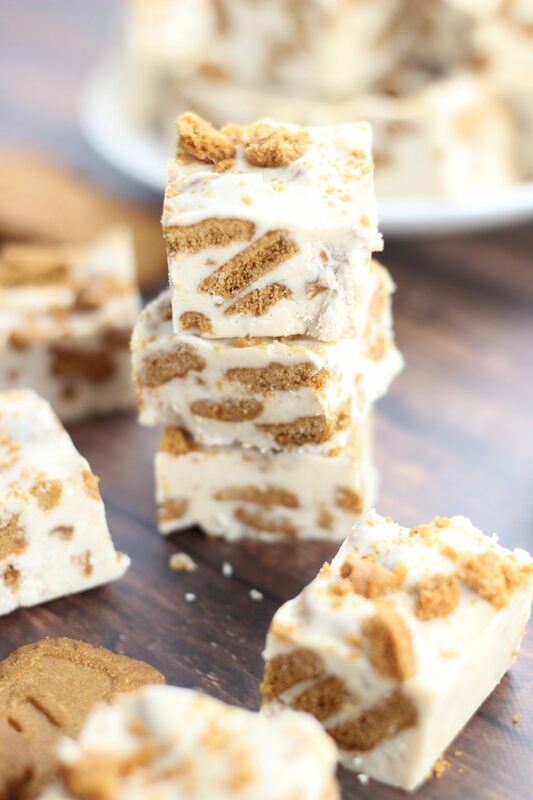 Biscoff cookies, cinnamon bun frosting, and white chocolate chips come together in this super simple and fast fudge! Microwave on high for 2 minutes, stir, then continue microwaving at 30-second intervals until the chips are completely melted and smooth. 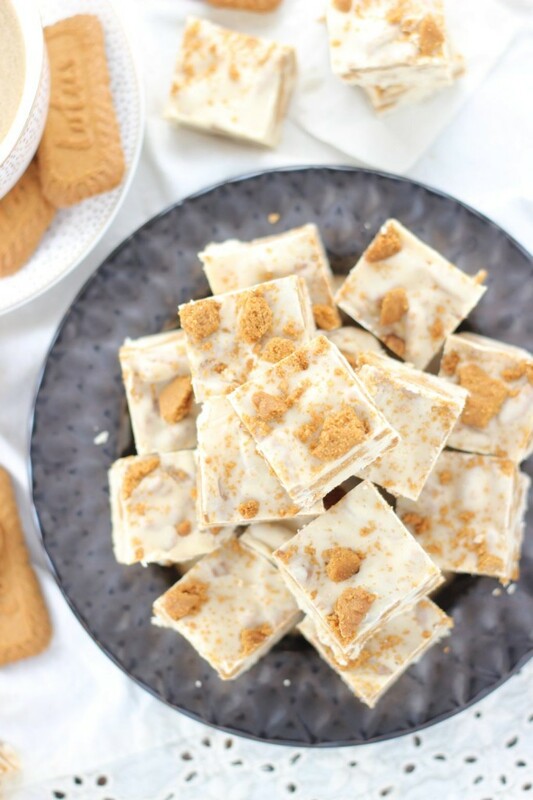 Fold in the crushed Biscoff cookies until just blended. 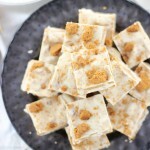 I just picked up some biscoff cookies, now I need to try this! This looks amazing, especially since those cookies are one of my favorites (well, they were, I’m off sugar for a year, yikes!) We just made a cake that uses the Bishoff cookie spread, and apparently it was delicious. Thanks for sharing on craft schooling Sunday, wonderful to “meet” you! 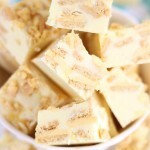 This fudge sounds devine! I didn’t know you could get cinnamon bun frosting, definitely looking for this on my next grocery trip. Thank you for this yummy recipe. 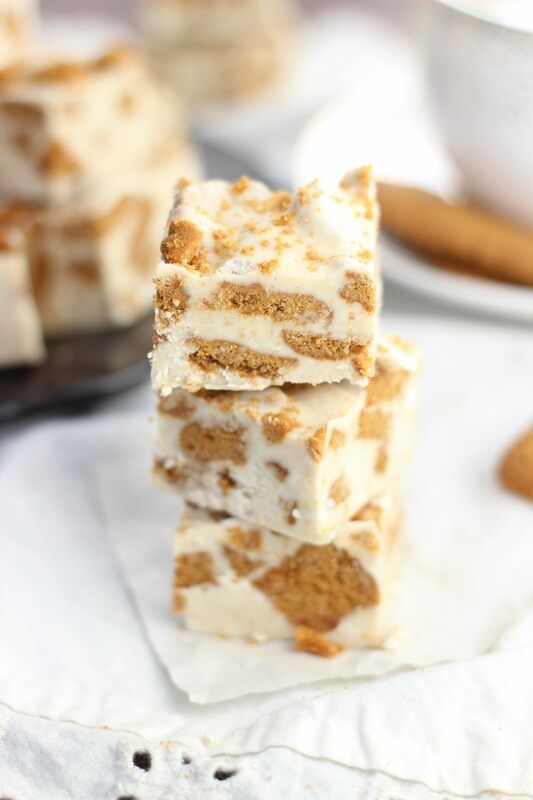 I think it might be a seasonal frosting, but you could also use a vanilla frosting or cream cheese frosting, and add a ton of cinnamon – effect would likely be similar. Glad you like it! Yummy taste! Thank you from Tasty Tuesday Creative K Kids. I pinned your post at Pinterest board. This is beyond amazing! YUM! Thanks for linking up with What’s Cookin’ Wednesday! Wow! This looks so good! 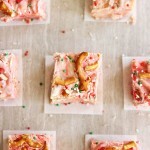 I never would think to use canned frosting for fudge- that is really handy for the holiday baking onslaught that is coming! Isn’t that cool? 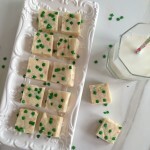 I didn’t know frosting could be made into fudge, but I’m very excited about that discovery! I made these tonight while preparing dinner. 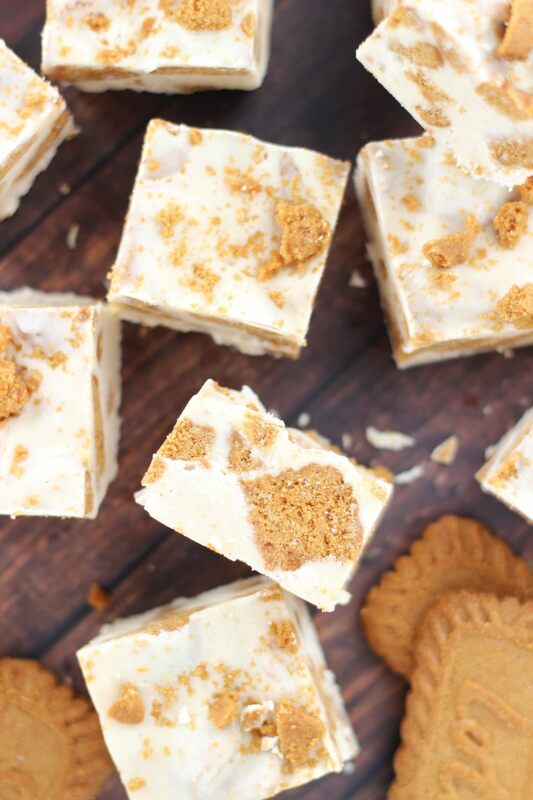 Unbelievably easy…And they are AMAZINGLY delicious! Thanks Sarah! This looks delicious. I’m not sure if we can get Biscoff cookies here (UK) or even the frosting. I’m off to the store now to have a look. 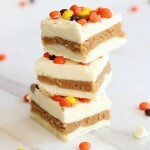 If not, I’ll be making these the next time we are in Florida.